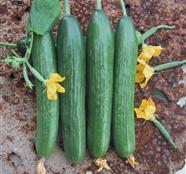 Parthenocarpic beit-alpha cucumber, suitable for protected cultivation. Vigorous early growing variety, producing 4-5 fruits per node, and an additional 3-4 fruits on the self-prunning lateral shoots. The 16 cm long fruits are slightly ribbed, green in color, with a round blossom end tip. Mike F1 handles well the differences between day and night temperatures.